The Corners of Brookfield is getting $7 million in improvements just a year after opening to improve the common areas of the 750,000-square-foot retail, restaurant and apartment development. “Now, open a year, we want to revisit some elements of the common areas and better execute them for the benefit of our guests, our tenants and the Town,” said Robert Gould, head of U.S. operations at IM Properties, which is part of the joint venture that developed The Corners. Price Erecting was called in to handle this dynamic project given the unique needs of the task. The task at hand was challenging as it required the integration of standing elements, but the impact it will have on the residents there is absolutely worth the undertaking. The community will be able to enjoy thoughtful amenities such as updated lighting, signage improvements, high-speed elevators, easier traffic routing, as well as a new parking lot. In addition to daily living improvements, upgrades to the dining, shopping, and entertainment areas have been made to enhance the experience to be more enjoyable. Perhaps the most exciting news is the much anticipated Spring 2019 unveiling of the new Silverspot Cinema. Our collaboration with Peppers Construction has provided a premier, customer-centric cinema to be enjoyed by all. Silverspot Cinema is known for their hassle-free, yet sophisticated entertainment theaters. They support a wide sector of interests by hosting independent films to concerts. Guests can choose to enjoy the theater’s sleek bar and lounge as well as the iconic movie-going snacks that you look forward to. These additions were inspired by feedback from the people who have enjoyed the facilities and suggested ways to better the experience. 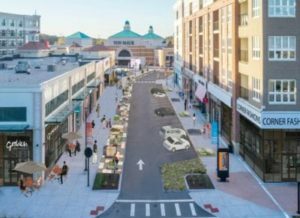 The building updates to The Corners of Brookfield will improve the shopping, living, and dining experiences for all who visit it. Be sure to stop over and check out the new space!